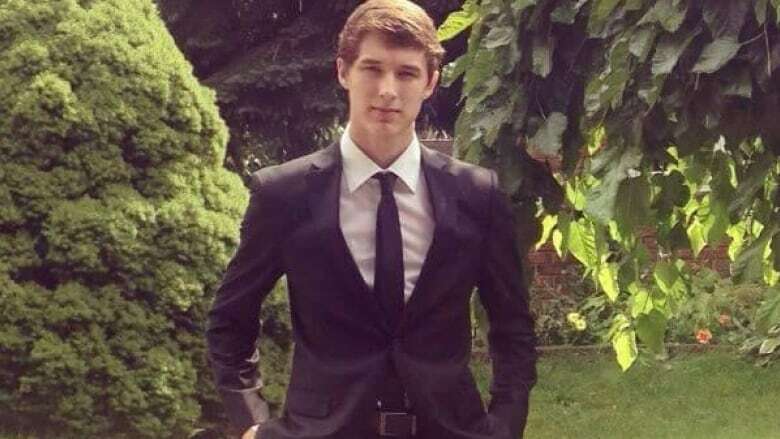 The shooting death of an 18-year-old man trying to retrieve his lost smartphone highlights the risks of using mobile-tracking app, say police. The shooting has prompted a manhunt in London, Ont., for three young men who were at the scene. The shooting death of an 18-year-old man trying to retrieve his lost smartphone highlights the risks of using mobile-tracking app, say police. "It's certainly extreme," London Police Const. Ken Steeves told The Canadian Press.​ "No one ever would have predicted or even thought that a loss of life would have resulted from a loss of a phone,"
The teen's death has prompted a manhunt in London, Ont., for three young men who were at the scene. Jeremy Cook, a native of Brampton, Ont., was gunned down at about 5:15 a.m. ET on Sunday. London police found his body at the rear of a strip mall near Huron Street and Highbury Avenue in the city's north end. He had multiple gunshot wounds. Cook had left his smartphone in a taxi and traced it electronically to an address on Highbury Avenue. When he and a relative went to the address, he was confronted by three men in a car, Steeves told CBC News. What happened next is still being pieced together, but police say that when Cook tried to retrieve his phone, the vehicle began to drive away, prompting him to grab on to the driver's side door. Shots were fired and Cook died from multiple wounds. The car, a Mazda sedan, was found abandoned nearby, where it had hit a fence and then a telephone pole. Police also recovered Cook's phone and have obtained surveillance video from the area. Steeves said that unlike in many violent cases, Cook had no connection to his attacker. He also said Cook had never been in trouble with police. The police arrested three people near the scene, but they were found to be uninvolved and were released, Steeves said. A black male, wearing a white shirt with a black design. A black male, with very short hair, wearing a black jacket or shirt and a fitted hat. A black male of slim build, wearing a blue shirt and a black hat. Steeves said he has no problems with phone apps that trace the owners' phone location. However, while the shooting wasn't Cook's fault, people should step back and call police if there's any potential for violence, he said. As the investigation continues, police are urging anyone using an app to track down a lost or stolen phone to use caution when they enter what might be a risky situation. "The app itself is a great tool to have. Nobody could ever predict that what occurred was going to occur in that case," Steeves said. "But if you suspect there's any potential for violence at all, we certainly encourage people to contact police. We'd be more than happy to come out and investigate with the hopes of retrieving the phone." Cook's case is thought to be the first time London police are dealing with a case of serious violence stemming from tracking down a waylaid phone, but Steeves said police may have helped others find their devices in the past through routine calls for assistance. He noted, however, that the tracking application used by Cook wasn't what had resulted in his death. "It wasn't the app that took away Jeremy's life, it was the individuals, which would be rare, who happened to be armed with a gun," he said. While Cook's death has stunned many who have heard his story, at least one mobile trend analyst says the motivation to track down a phone is understandable. "Efforts by individuals to track their mobile devices and smart phones is linked to the extent to which we feel emotionally connected to our mobile device," said Sanjay Khanna, a mobile phones analyst with information technology market intelligence firm IDC Canada, who noted that phones now contain a significant amount of a person's data. "Our attachment to our data is so strong that it might prompt people to not be as cautious as authorities might wish us to be." Phones are often also costly, Khanna said, which adds to the motivation to get a device back. That's not to say the use of tracking apps is always risky, said Khanna. After leaving a phone in a restaurant or at a party, the apps can help owners retrieve their devices safely, he said. "It could be pretty innocuous kinds of situations that people get into on a regular basis," he said. "The advice from police is typically not to go after your mobile device if that's going to put you in any sort of danger."